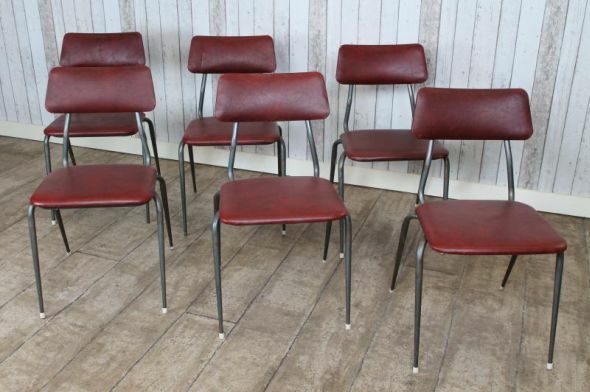 A new addition to our extensive range of vintage furniture, these stylish 1950s steel vintage stackable chairs feature a curved and upholstered red back support with matching seat. They would make a real statement in any vintage home interior, restaurant or bistro. The chairs conveniently stack away which is ideal if you need to save space. They are in good condition for their age, with some general wear and tear to the paintwork. We feel that this adds to their character! Unfortunately, some of the small plastic caps are missing, but these can be purchased over the internet if you wish to replace them. Please note that this listing is for one of our vintage stackable chairs, but we do have more available. These chairs have sold out.